كولن لوثر پاول (5 أبريل 1937 - ) جنرال وسياسي أمريكي ولد في نيويورك في عائلة مهاجرة من أصل جمايكي. تولى وزارة الخارجية الأمريكية من 20 يناير 2001 حتى 26 يناير 2005 في الفترة الرئاسية الأولى من عهد الرئيس جورج دبليو بوش. وكان قبل ذلك قد وصل إلى رئاسة هيئة الأركان المشتركة الثانية عشر وذلك بالفترة من 1 أكتوبر 1989 حتى 20 سبتمبر 1993. 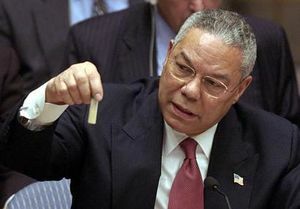 Wilkerson said that he participated in a hoax on the American people in preparing Powell's erroneous testimony before the United Nations Security Council. Secretary Powell with NATO Secretary General ياپ ده هوپ شفر. 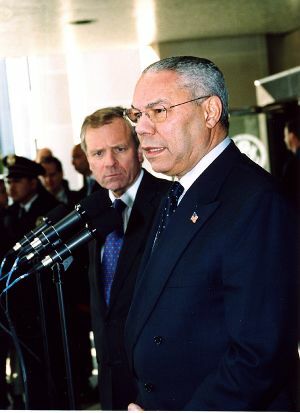 Powell announced his resignation as Secretary of State on November 15, 2004. According to the Washington Post, he had been asked to resign by the president's chief of staff, أندرو كارد. 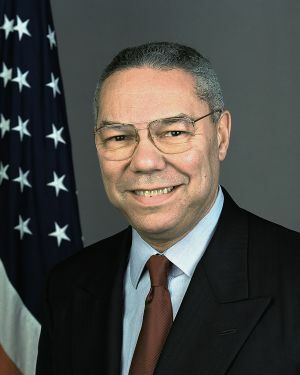 Powell announced that he would stay on until the end of Bush's first term or until his replacement's confirmation by Congress. 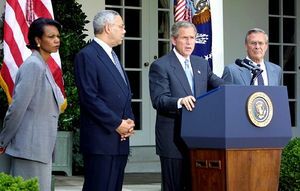 The following day, Bush nominated National Security Advisor Condoleezza Rice as Powell's successor. News of Powell's leaving the Administration spurred mixed reactions from politicians around the world — some upset at the loss of a statesman seen as a moderating factor within the Bush administration, but others hoping for Powell's successor to wield more influence within the cabinet. On December 31, 2004, Powell rang in the New Year by throwing the ball in Times Square with New York City Mayor Michael Bloomberg, ushering in the year 2005. He appeared on the networks that were broadcasting New Year's Eve specials and talked about this honor, as well as being a native of New York City. 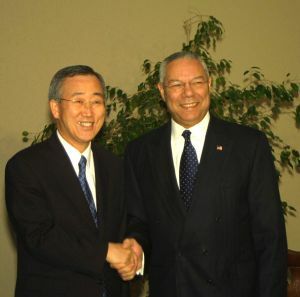 Powell with United Nations Secretary-General Ban Ki-moon. قبل أسابيع قليلة من الانتخابات الأمريكية 2008 أعلن في لقاء صحفي مع قناة أن بي سي عن دعمه للمرشح الديمقراطي باراك أوباما الأمر الذي فاجئ الجمهوريين وماكين والشعب الأمريكي، كما إنه قال إن أوباما لديه القدرة على الإلهام، وكل الأمريكيين وليس فقط الأمريكيون من أصول أفريقية سيكونون فخورين بفوز أوباما، كما إنه شدد على قدرة أوباما في مواجهة الأزمة الاقتصادية، ويعتبر هو أول عضو جمهوري بارز وكبير يؤيد أوباما. وبعد الانتخابات وصف فوز أوباما بالتاريخي وهنئه وهنئ الشعب الأمريكي بفوزه. ^ "Colin Powell on Iraq, Race, and Hurricane Relief". 20/20. ABC News. September 8, 2005. Retrieved February 3, 2007. ^ Sciolino, Elaine (November 18, 2004). 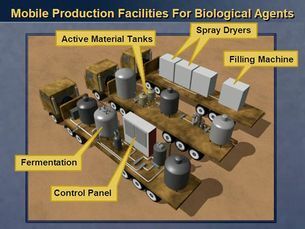 "Exiles Add to Claims on Iran Nuclear Arms". New York Times. Retrieved February 8, 2007. ^ VandeHei, Jim and Robin Wright (April 22, 2005). "Powell Playing Quiet Role in Bolton Battle". Washington Post. ^ Borger, Julian (April 23, 2005). "Powell's remarks harm Bolton's chances of UN job". The Guardian. Retrieved February 3, 2007. اقرأ اقتباسات ذات علاقة بكولن پاول، في معرفة الاقتباس. 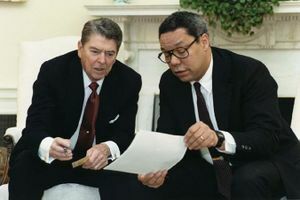 مشاع المعرفة فيه ميديا متعلقة بموضوع Colin Powell.